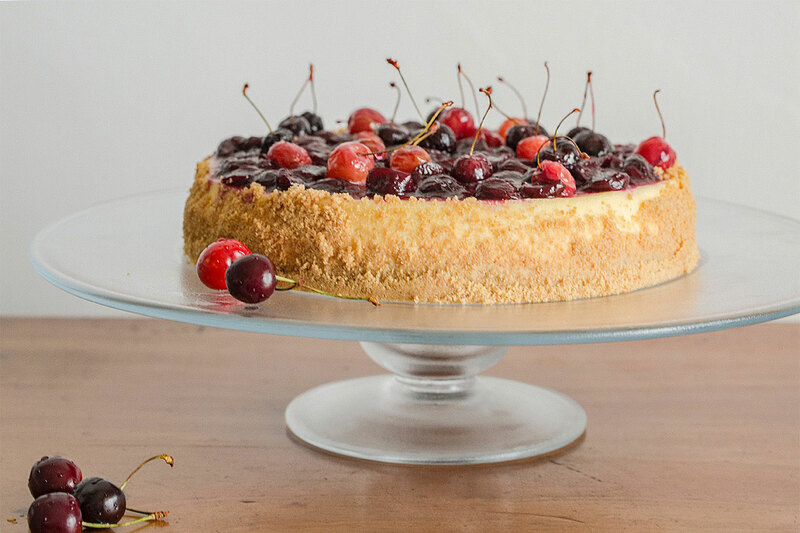 Based on a recipe by Nigel Slater, this cheesecake never flops or disappoints. I love its creamy texture which is at its best the next day. You can top it with different jams and fruits, I chose my home made cherry jam and topped it with a few cherries cooked whole in Syrup. Melt the butter in a saucepan. Crush the digestive biscuits to a fine powder. Tip the crushed biscuits into the butter and stir to mix. Press 2/3 of the buttered crumbs into the base of a deep 22 cm springform cake tin. Place in the freezer to cool. Beat the mascarpone, cream cheese, cream, 150 g caster sugar, eggs in a mixer. Add lemon zest and fold in the lemon juice and limoncello. Wrap the tin in aluminium foil, covering the bottom and sides with one single piece. Do this twice to ensure that water does not seep in. Pour the cheesecake mixture on top of the hardened crumbs. Place the cake tin inside a roasting tin and pour enough boiling water to go up half way its side and then carefully slide them into the oven. Bake for fifty minutes then switch off the oven and leave the cake to cool in it. Make a syrup with 100ml water and 50 ml sugar, drop the cherries whole in the syrup and simmer for 10 minutes. When the cake is cold, remove it from the tin and press the remaining biscuit crumbs around the edge. Cover the surface of the cake with the cherry jam and garnish with the cooled cherries in syrup.